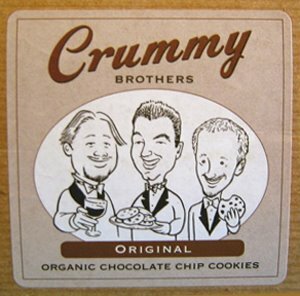 I so love that the Crummy Brothers (nod to Josh Spear for introducing us to the super cool company) gave the chocolate chip cookie a posh new look. The sophisticated flavors like Lemon Ginger Chocolate Chip and Saffron Pistachio Chocolate Chip are far from child’s play. You’ll wanna forego the milk, and pair with a dessert wine instead. For starters, I tried the Original: a basic recipe made with organic chocolate (organic cocoa beans, organic evaporated cane juice, organic cacao-butter and non-GMO soy lecithin). The note inside says that the Crummy guys use dark Ecuadorian chocolate, and lots of it. Each bite is chocked full of yummy chocolate chips. The sugar on the cookies edge is carmalized for added crunchiness while the center stays nice and chewy. 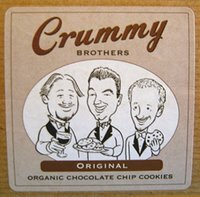 My cookies arrived with a handwritten thank you note from Brian and an arrow pointing to the guy in the middle, thanks Brian! I love the witty branding. Could the name be any more perfect? These guys seem to be great at the art of self-deprication, trust me, these delicious morsels are hardly crummy!